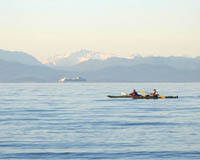 We feel truly blessed to be living on this little piece of paradise called Vancouver Island. We?ve been living here for almost 5 years and still have to pinch ourselves every year around this time when we see crocuses, tulips and daffodils poking up through the soil. We moved here for the quality of life, for us, but mostly for our children. Clean air and water, safe streets, little traffic, good bike lanes, beautiful beaches, parks, trails, good schools and fantastic weather. Mo:Le ? great food (breakfast/lunch) reminds us a lot of Queen St West in Toronto. Our whole family cycles and we spend a lot of time riding. My husband commutes to work via bike (26K round trip). Victoria has some of the better bike lanes, but the pearl is the Galloping Goose trail which runs from the Sooke Potholes to Downtown Victoria and up to Sydney. You can find one of us on some section of the Goose most weekends. 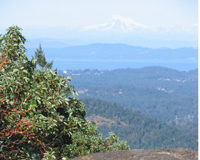 The Victoria area also has some great mountain biking trails – so I?m told.? We never got into mountain biking so I can?t say from personal experience. We used to hike around one or both of the Thetis lakes (upper and lower) almost every weekend. Still get out there about once a month. It?s tranquility and beauty is soothing. Mt Work is a nice hike. Suitable for the whole family. You?re rewarded with a beautiful view of the Saanich inlet after an hour or so of hiking. Mt Finlayson ? we love this hike. Fairly intense. Definitely makes you feel alive. Glendale Gardens ? the gardener?s garden. We are family season pass holders and visit the gardens regularly. It helps that my husband works just down the road. The Gorge ? any part of the gorge, it?s just magnificent. Rathtrevor in Parksville – if you’re camping with a family (especially young children) you can’t do better than Rathtrevor. This is easily the cleanest and most family friendly campground we’ve ever been to. The shower and washroom facilities are clean with plenty of hot water. The beach goes for miles and the tide goes out so far the kids can run forever in ankle deep water. Gordon Bay on Lake Cowichan – also a great family campground. Set on beautiful Lake Cowichan. Tofino ? we LOVE Tofino. It?s simply beautiful. Beaches, surfing, marsh hikes, the bay side, rainforest, it?s got it all. Salt Spring Island ? slightly embarrassed to admit that this is the only island we?ve been to yet. I?ve heard great things about all the islands and look forward to travelling there. If you are planning a trip to Victoria let the professionals at Victoria Concierge prepare a customized travel plan for you, based on your specific preferences and requirements, so you get the most out of your stay. What do you love most about Victoria? Please leave a comment.